A classic never goes out of style. 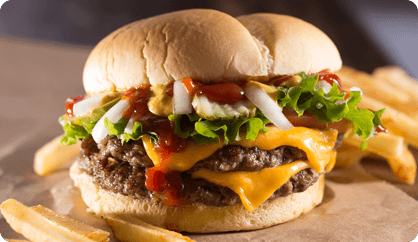 Two beef patties cooked-to-order, American cheese, lettuce, tomato, pickles, onions, and of course, ketchup and mustard. A two-patty Texan delight. 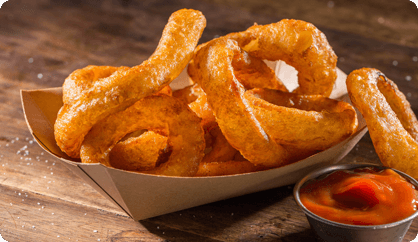 Topped with cheddar cheese, our signature crispy onion rings, and a BBQ sauce tangy enough to kick anyone off their mechanical bull. “Hold the bacon,” said no one ever. 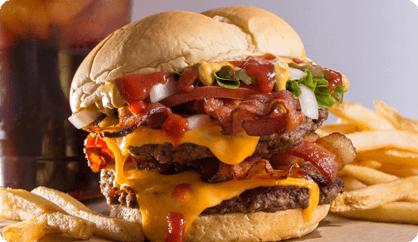 Our classic burger topped with four slices of crispy bacon for mouthwatering perfection. 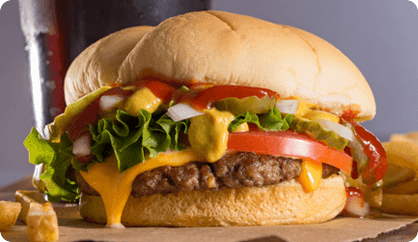 American cheese, lettuce, tomato, pickles, onions, and of course, ketchup and mustard complete this masterpiece. Take a trip to the land of Tar Heels and Palmettos with this southern-style burger. Served with yellow American cheese, slaw, chili, onions, and mustard. It's great, y'all. We encourage you to pronounce all four E’s when you order. 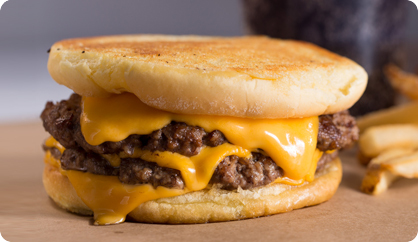 Four slices of melted American cheese and two beef patties cooked-to-order, sandwiched between an inverted, grilled, and buttered bun. 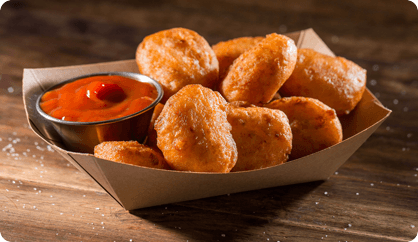 All the comfort of mac and cheese in a fried bite-sized snack. If you can think of anything that doesn’t taste better fried, please let us know. Crispy battered rings with a side of whichever dipping sauce you’d like. There’s no way to go wrong here. Keep it simple. 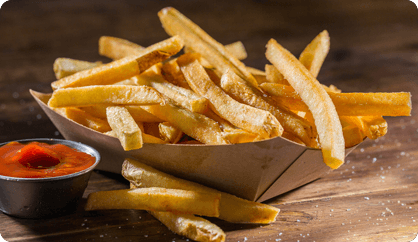 After all, there’s a reason burgers and fries have been sold together for so many years. Try them with a dipping sauce! You can't go wrong with this tried-and-true classic. 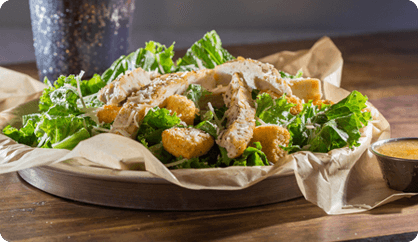 Crisp green leaf lettuce, shredded parmesan cheese, croutons, and creamy Caesar dressing. Extra charge for chicken. A traditional but tasty salad that perfectly hits the spot. Crisp green leaf lettuce, tomato, cucumbers, onions, croutons, and Cheddar Jack cheese. Topped with balsamic vinaigrette dressing. It’s not just for Philly anymore. 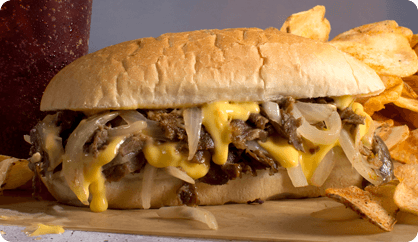 Melted American cheese topping shaved steak, accompanied by juicy grilled onions. 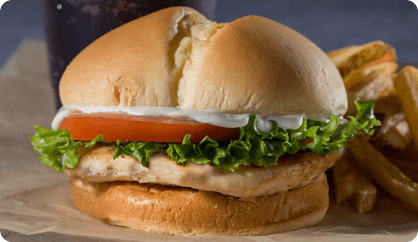 Chicken served hot in between two buns. We can’t say what combination of toppings is best, but we can promise you’ll love it no matter what you choose. A crispy sandwich that’ll give your favorite fish dinner a run for its money. 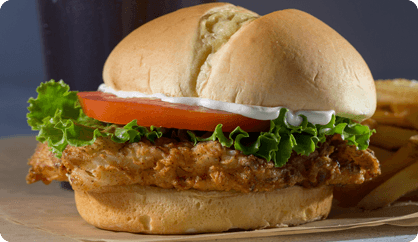 Topped with lettuce and tartar sauce for a complete seafood experience. Not a big beef person? No problem! Begin with a wholesome Gardenburger®, made with natural vegetables and grains, and customize it however you like! 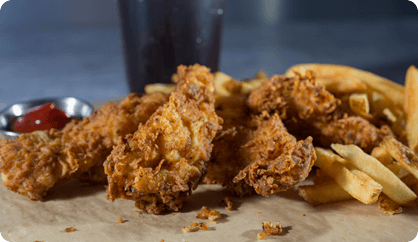 Hand-breaded tenders accompanied by your choice of dipping sauce. They may sound traditional compared to some of our other options, but they rival anything on the menu. Making a decision can be hard. 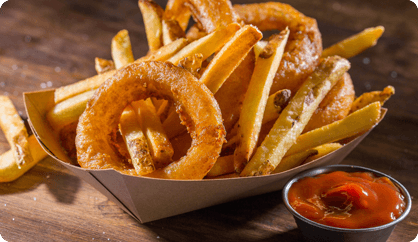 We’ll take that pressure off your hands with this combo order of fries and onion rings. We serve a wide variety of beverages, so choose whatever you think will complement your food best. Brought the little ones with you tonight? Great! These yummy classic options are the perfect choice to fill them up and keep them busy! 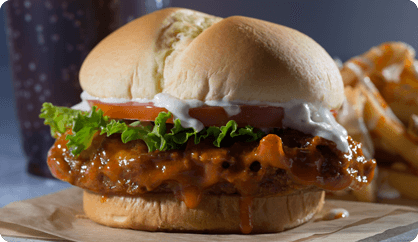 The tasty flavor of Buffalo wings delivered in a (slightly) less messy way. Crispy hand-breaded chicken tossed in Frank’s RedHot® for a powerful kick and delicious taste. Topped with lettuce, tomato, and creamy ranch or blue cheese dressing. 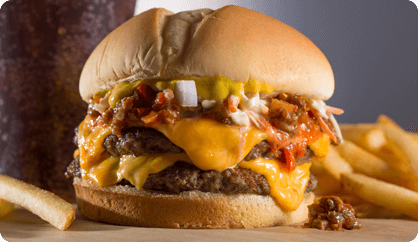 Craft your own double burger! Start with two beef patties cooked-to-order, then get cheesy with four options to choose from. Top it off with fresh veggies and select from 10 flavorful sauces to dunk, dip or sauce it up. Cravin’ a little less? Craft your own single burger. 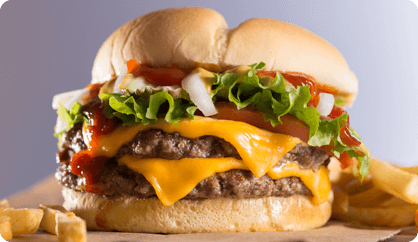 Start with a cooked-to-order patty, then get cheesy with four options to choose from. Top it off with fresh veggies and select from 10 flavorful sauces to dunk, dip or sauce it up. Start with a Sabrett’s® all-beef frankfurter and top it your way! Go ahead and try to think up an order we haven’t heard yet. 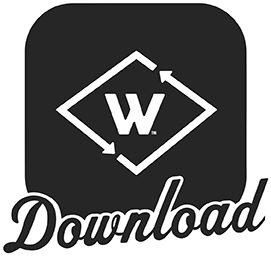 We double-dog dare you. We take time to perfect the crispiness of our chicken, marinating it in buttermilk before dipping it in spices and finally deep frying it. Served between two buns and topped with whatever the heck you want! Bacon, lettuce, and tomato topping a tender grilled chicken breast. If the name doesn’t explain itself clearly enough, we’ll let the flavors do the rest of the talking. Get it ‘Crispy’ with a hand-breaded chicken breast. Get your spice on! 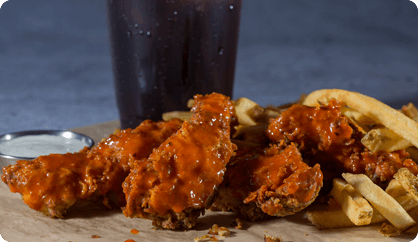 Our hand-breaded tenders topped with buffalo sauce for that extra bit of flavor. * Regional item. Products may vary by location. What's a burger without a shake? These hand-dipped delights, crafted to order with Blue Bunny® ice cream and milk, are the perfect complement to any meal you choose.